Do you watch food channels on TV? I love them. It's an acquired taste, at least in my case. When I met my now husband years ago, my cooking skills didn't go much beyond making a cheese sandwich. So when I learned that my husband loved to watch BBC Food or Food Network, it struck me as very strange and not particularly in his favor. Fortunately, there were enough other good things about him, that made me oversee this food channel obsession. Several years fast forward, I love to watch food channels myself. When I am too tired to watch a movie or clever documentary, I switch on to some food channel. One of my favorite programs these days is CHOPPED on Food Network. In CHOPPED, contestants are presented with a mystery basket that contains a quirky combination of three ingredients for either starter, entree or dessert. The other day, contestants were asked to make an entree out of a whole turkey, kale and marshmallows. Get the drift? Originality and creativity is being asked for, and although I will probably never find out, how turkey stuffed with kale and marshmallow tastes like, I love to watch what these chefs do with the ingredients. Now here is my mystery basket: sesame seeds, seaweed and maple syrup. 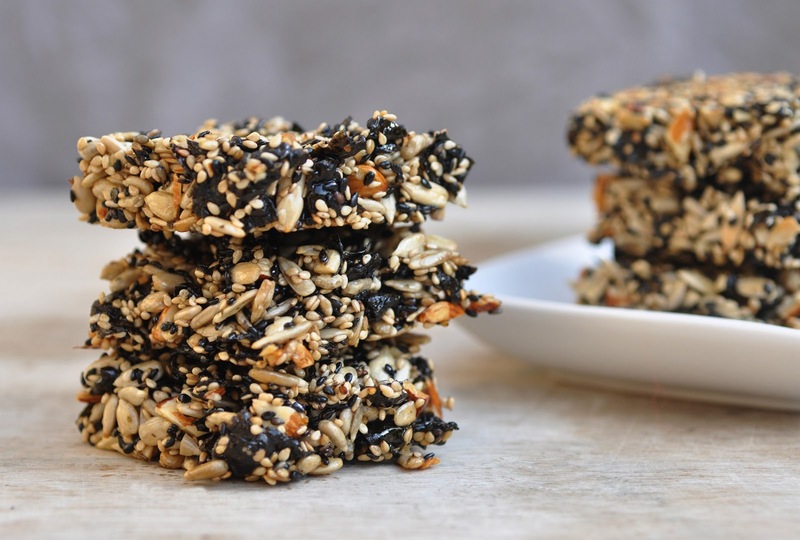 Make some utterly delicious seed bars!! Who would have thought of putting seaweed and maple syrup into the same pot. Add some nuts and seeds and I promise you, it works. It's not my idea, I experimented with recipes that I found here and here. Even my much loved Flavor Bible didn't have an answer to this flavor combination. 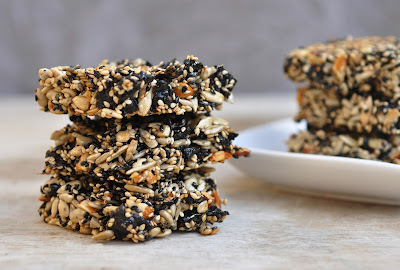 This bar will surely be one of my all-time favorites: a deliciously sweet seed bar with all the good and nutritious things that come naturally with sesame, nuts, seaweed and maple syrup. Combine all seeds and the chopped almonds in bowl. In a large dry pan over medium-low heat, roast seeds and nuts for 5-7 minutes, or until fragrant. Stir regularly to provide even roasting. Transfer back to bowl. Stir in Nori slivers. Pour maple syrup over the seaweed seed mixture and stir until mixture is evenly coated and sticky. Use the prepared baking sheet as surface and fill large cookie cutters with the batter. Press down the batter. with a teaspoon or your fingers. Gently remove the cutter to keep the bars in shape. Repeat until all batter is used up. Bake for 15-20 minutes. Let cool a little on baking sheet. Then carefully remove bars from the parchment paper. They might still be sticky underneath. Transfer to cooling rack, or simply turn bars upside down to coll and dry completely.